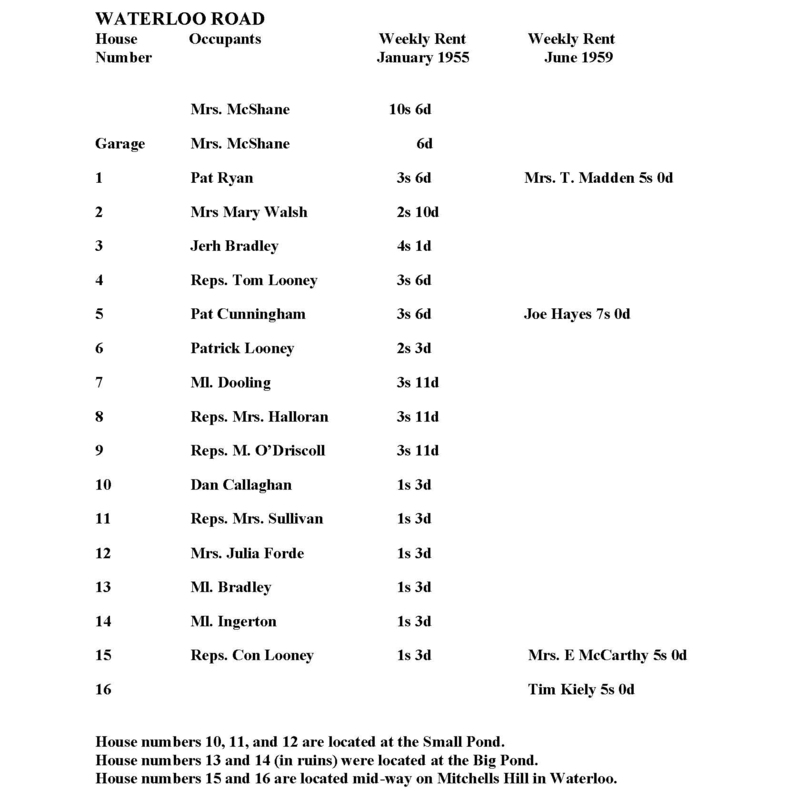 The following is a list of the names of the main occupiers (tenants) of the Mahony Mill Houses and the rents paid by them, as per the records in the Mahony Rent Ledger, for the period from 3rd January 1955 to 29th June 1959. The amounts are shown in the old £.S.D. Sterling (Pounds, shillings and pence) value which was the currency in use at the time. 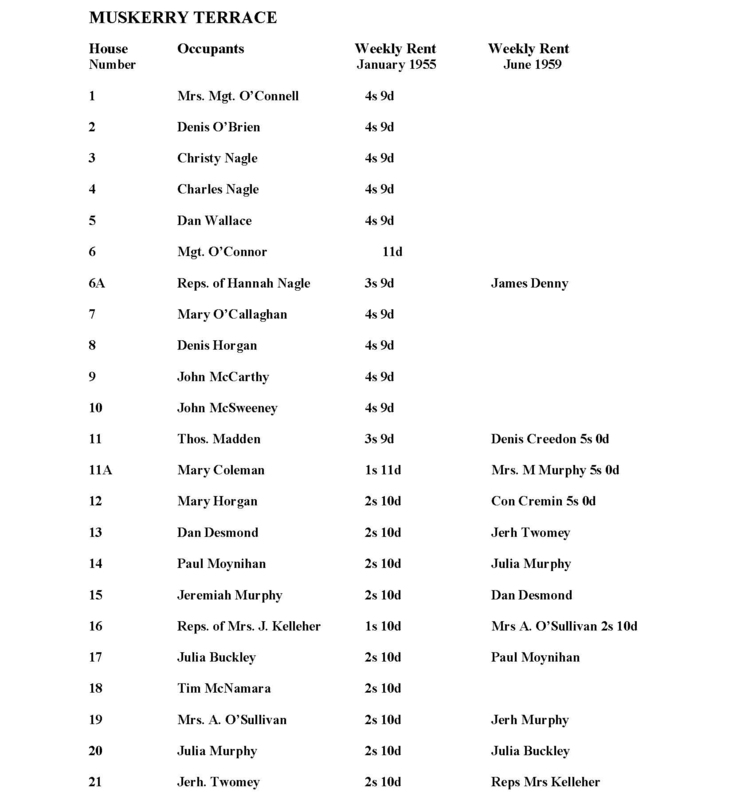 Family name changes in the various houses came about when a family outgrew the original house, normally through an increase in family numbers, applied for a larger house and then switching to the new address but still within the area of Mahony’s houses. Like-wise a person living alone in a larger house might transfer to a smaller sized one. 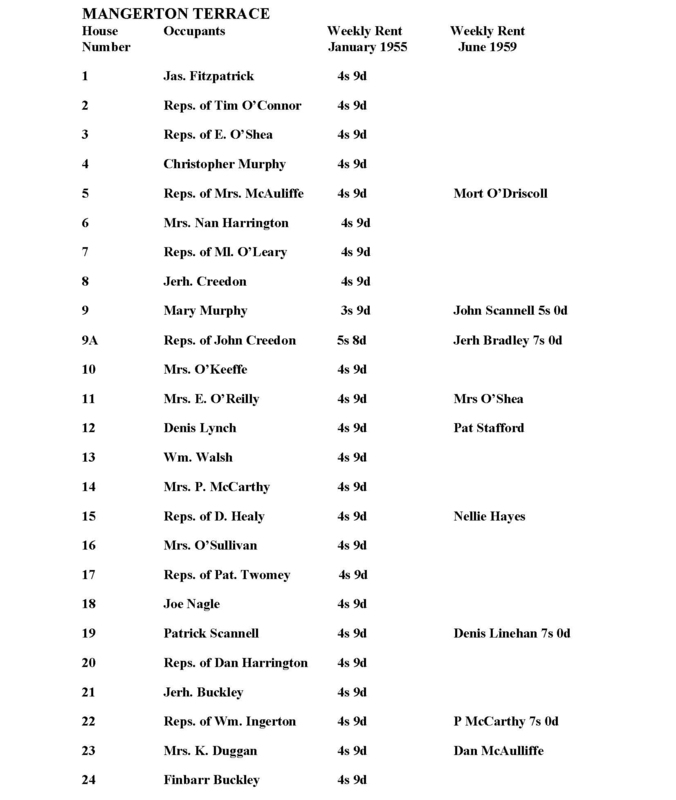 In the period mentioned above, January 1955 to June 1959, there was virtually no change in the surnames of the occupiers of Mahony’s houses. 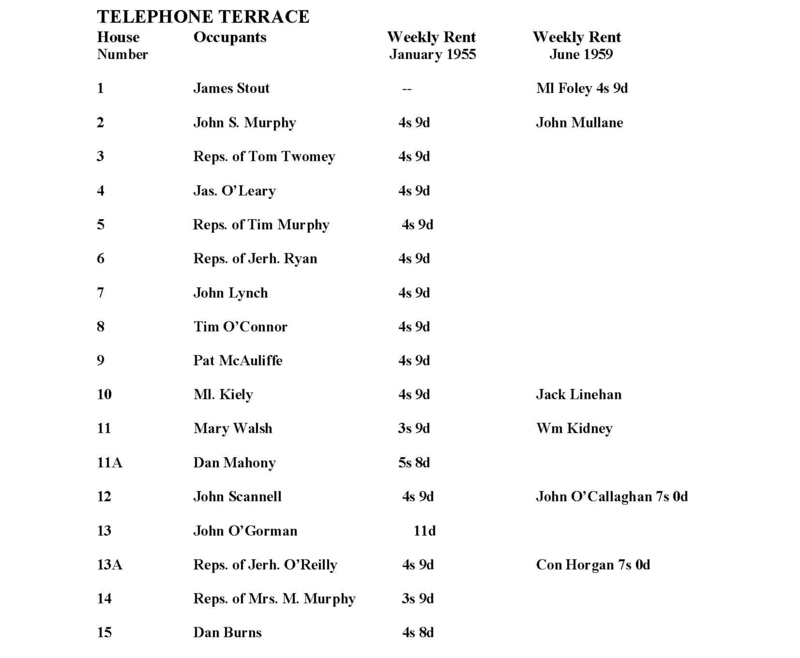 In the very rare case of a name change, it usually came about when a tenant passed away and a person who had married into the original family took over the rental agreement and payments but still had to work in Mahony’s mills as per the original agreement between the tenants and the owners, Mahony’s. On the other hand, I have not become aware of any eviction from a mill house ever taking place. 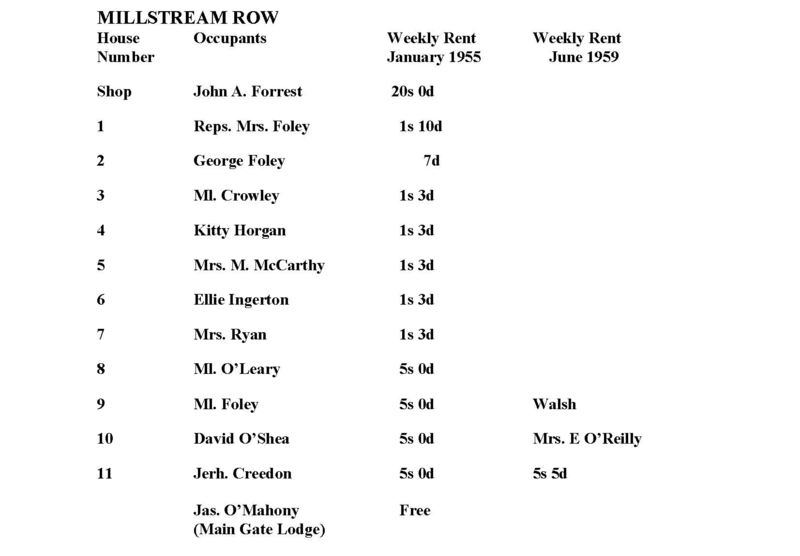 The columns on the following pages state the names of the tenants who were in occupation in the various Mahony Mill Houses on 3rd January 1955 followed by the amount of weekly rent paid at that time. 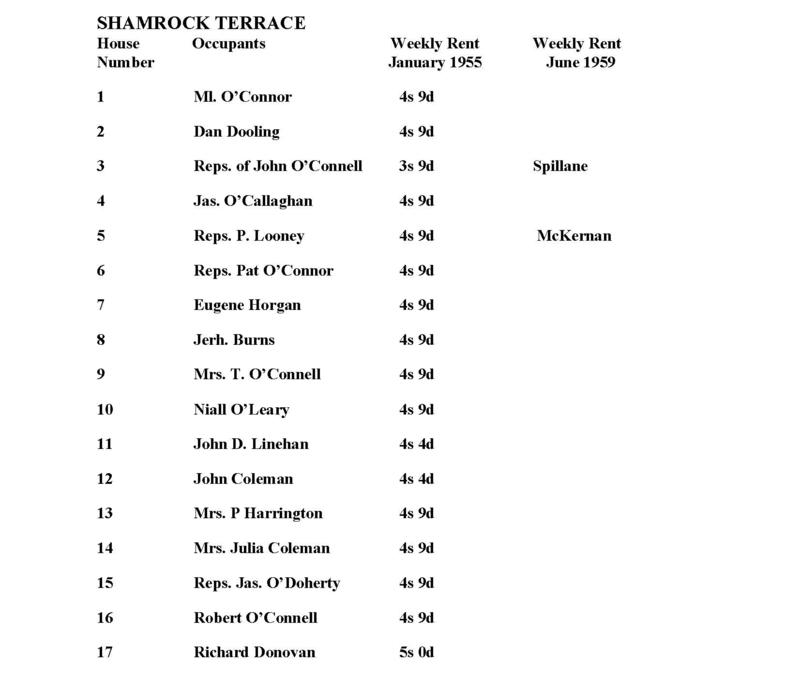 If the column for June 1959 has no name change, it means that the same occupier was still in that particular house and had no rent increase over the four-year period. Where a new name occurs, it means that there was a change in tenancy sometime within the four-year period and possibly also an increase in rent charges. In late 1972 Mahony’s mill houses were eventually offered for sale to the tenants and were sold off at prices varying between £500 and £350 sterling.